1. Remove the old cabinet and measure the opening in the wall. Height, width and depth each needs to be entered when the order is placed. 2. When your cabinet arrives, unpack it. Typically, the door is packed un-installed and the hinge screw holes are pre-drilled for you. All of the door hardware is pre-installed for you. 3. You'll need a small drill, four 1 1/2" wood screws and a screw driver. 4. Have a helper hold the cabinet in place, and on the hinge side, drill two starter holes from the inside of the cabinet case (NOT the face) into the wall stud. Place one screw towards the top, another towards the bottom. Test to see if the cabinet is hanging straight. 5. If the cabinet is not straight, remove it and install a thin piece of cardboard or sliver of wood at either the top or the bottom so it rests between the outside of the cabinet case and the side of the wall stud. Hold the shim in place with tape or glue, and re-install the cabinet and the screws. 6. If the cabinet is straight, drill two starter holes from the inside of the cabinet into the wall stud from the other side of the cabinet and into the wall stud. One screw towards the top, another towards the bottom. 7. 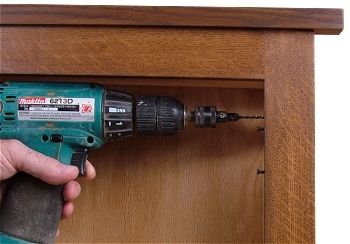 Install the cabinet door with the screws supplied. Adjust the door so it fits the opening, and tighten securely.